Prince Philip, the 95-year-old husband of Britain’s Queen Elizabeth, will retire from carrying out royal engagements later this year, Buckingham Palace announced on Thursday. 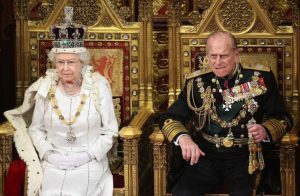 Britain’s Queen Elizabeth next to Prince Philip, during the State Opening of Parliament in central London May 9, 2012. “Prince Philip will attend previously scheduled engagements between now and August, both individually and accompanying The Queen,” the statement said.